Regalia Residence Homestay is a tastefully furnished apartment in the heart of KL. 5 mins' walk to rail stations (KTM & LRT) with gym, private theater, library, swimming pool at the 37th Floor with a panoramic city view KL tower &Twin-Tower. Night view is excellent. The apartment is located at Kuala Lumpur city center with Quite pool view from the room. 24 hours security. 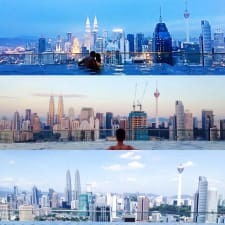 Infinity pool with amazing panoramic view of KL city skyline. Very near to two train stations, 5min walk to Sunway Putra Shopping Mall and PWTC.